Aspirations, Rose coloured spectacles, Blue skies, Great expectations, Possibilities, Anchors and a glimmer. Empty contents into the future and stir gently. Do not add cynicism or boil as this will impair the outcome. 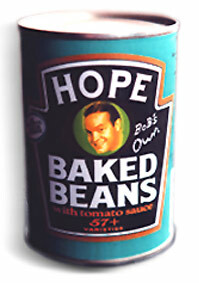 A serving of 210g of Hope Baked Beans gives you the spiritual benefits of; More expectations than a bowl of branflakes, More reassurance than a glass of milk, or an egg. Less despair than a carton of cottage cheese. Something as simple as Hope Baked Beans on toast will bring you and your family in direct contact with a stunningly bright future. For more information write to, Hope Nutrition , Optimism Inc, Just around the corner.